Attending college for your first time can be scary. Whether it’s your first semester or last semester, I’m going to guess that most of us get the first day jitters. However, what if it’s your first day of college and you are going back to school an adult? Yes, I know, 18 year olds are adults. However I mean, what if after high school instead of going to college, you worked full-time and took a break that lasted years? More and more adults are going back to college in their later years. 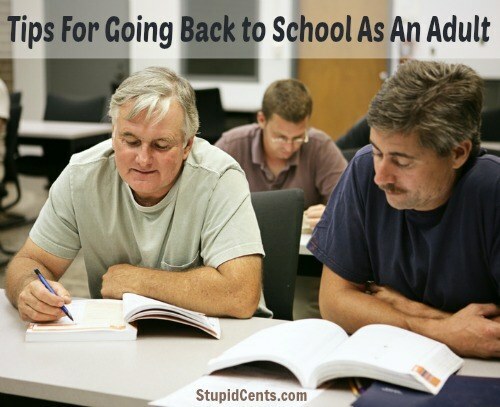 Going back to school as an adult can be a very different experience than if you went to college right after high school. My significant other is about to go back, and he hasn’t been in school since he was 18. He didn’t take a very long break, but it is a break of over 6 years. This can still be intimidating since he will be older than many of his fellow classmates. As an adult, a big factor of whether or not you can even attend school is money. Will you work full-time while attending college? Will you only be able to attend college part-time since you will have to work? Or have you saved enough so that you can leave your job and primarily focus on your studies? College is expensive. There are many different things to pay for. How will you make money while in college? If money is still needed (because I’m going to assume that you are a normal person with bills), then there are many ways to make money while in college. If you are older, you might see all of those younger students and feel envious of them. Maybe you want to finish faster because you feel that you’ve lost out on valuable time. However, don’t feel rushed. Attend college with what works best for you. It is not a race. If you can and/or if you have time, looking into being active at your college. There are so many activities, and networking when you are in college is important. There are most likely a lot of other students who are your age as well, so go and meet them! If you are attending college for the first time in many years, then taking a few courses instead of a full load may be best. You never know if you might prefer online or offline classes more. You also might not remember what study and homework habits work best for you. Since you have had time to think about it, it is very likely that what you are going to college for will benefit your life directly. You are probably following your passion or you know what degree will benefit your chosen field the most. Challenges are good for you. When was the last time that you did something new and exciting? You can learn online. For some of us, online learning was not available when we were in college. However, online learning is available at most colleges. What tips would you give to a person going to college for their first time? I went back to school just gone 30 years old and it was for 5 years and it was the best decision I ever made. If you have the right mindset and can keep yourself organized it’s not impossible. I am proof of that but it can get distracting unless you remember the end goal, a new career.